The volcanism of Iceland is unique in its diversity and setting, producing both mafic lava shields and stratovolcanoes, with a range from phreatomagmatic (explosive) to effusive (lava) eruptions (1). 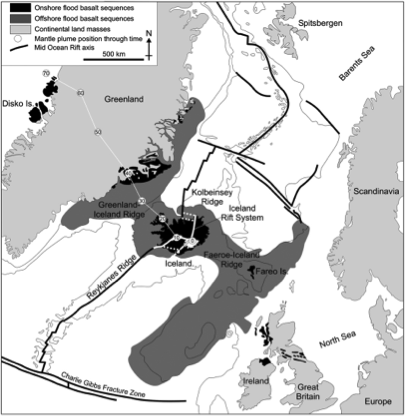 This is due to its location above two mid-ocean ridges: the Mid-Atlantic Ridge and the Greenland-Iceland-Faroe Ridge, forming a basaltic island believed to be produced from the interaction between a spreading ridge and a hotspot (1). Historically, past eruptions extruded a range of volumes from 1 to 20 cubic kilometers of eruptive products at an average frequency of 20-25 eruptions per 100 years. In recent times, the most disruptive eruption was the 2010 eruption of Eyjafjallajokull, which ejected 0.25 cubic kilometers of tephra with a plume that rose 9km and was dispersed a total area of 7 million square Kilometers across Europe and North America (7). Figure 1 below maps Iceland above the double-rift system, providing explanation for its unique volcanic activity. The Indian-Eurasian collision boundary is predisposed to frequent seismic activity of high magnitude and widespread damage. GPS measurements show the Indian Plate and Tibetan Plateau to be converging at a rate of 20mm/yr, producing up to 2 meters in potential slip per 100 years and causing the upper surface of the Indian Plate’s basement rock to slide beneath the Himalayas (2). This built up stress tends not to release steadily but in large lurches, which result in yearly earthquakes of M>6, causing millions of dollars worth of damage and many fatalities (2). Figure 2 shows the potential magnitudes of predicted seismicity and their alarming proximity to large cities. The North Anatolian Fault is another source of regular seismic activity in the Eurasian Plate region. 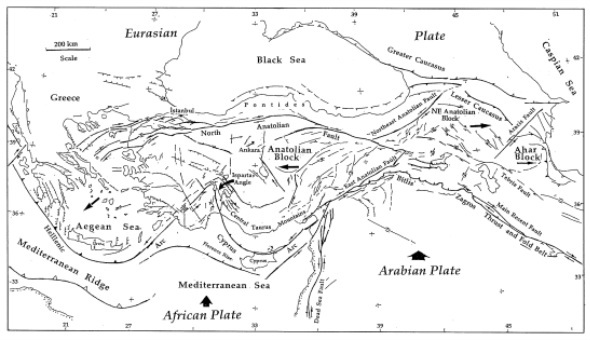 The fault is the result of the relative westward motion of the Anatolian Plate with Eurasia. It is a dextral strike-slip fault, with a NE-SW direction of extension and NW-SE direction of compression (6), which has resulted in 6 fatal earthquakes of M>6 in the last 20 years (5). It is believed the Zone has been active since the late Cretacious as it cuts through large ophiolite provinces in Eastern Turkey (5). The most significant earthquake of recent times was the 1999 Izmit earthquake, which registered as magnitude 7.5 earthquake and produced a 5.7m coseismic slip confined to the upper 10km of the crust (6). Figure 3 shows the far stretching Anatolian Fault and the surrounding plates' relative motion. The 2004 boxing day tsunami is believed to have been the most deadly tsunami of all time, it was the direct result of a slipping rupture zone on the Indo-Australian and Burma Micro-plate (3). The slip produced a magnitude 9.0 earthquake along the subducting Indian plate and the rupture zone was found to extend 1200km causing up to 15m slip and propagating a tsunami with recorded amplitudes of 30m (3). The resulting tsunami hit the coastlines of 11 Indian Ocean countries and had a death-toll of ~200,000 (3). 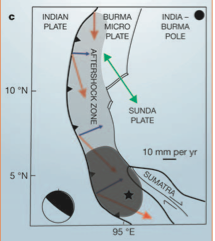 Figure 4 shows a simple tectonic map of the sumatra earthquake and the plate motion that caused it (3). 1) Thordarson, T., Larsen, G., “Volcanism in Iceland in historical time: Volcano types, eruption styles and eruptive history”, Journal of Geodynamics, Vol 43, 118-152, 2007. 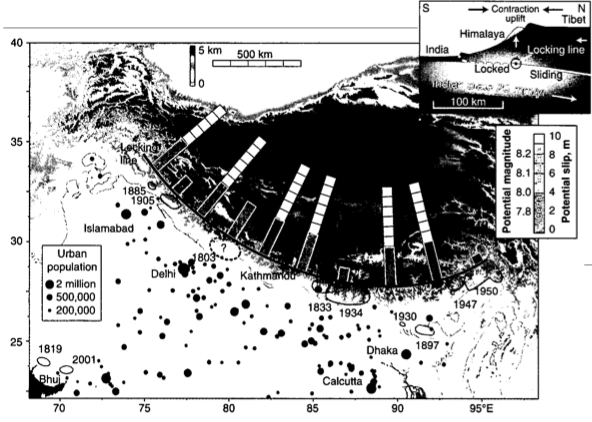 2) Bilham, R., Gaur, V.K., Molnar, P., “Himalayan Seismic Hazard”, Science, Vol 293, 1442-1444, 2001. 3) Stein, S., Okal, E.A., “Speed and Size of the Sumatra Earthquake”, Nature, Vol 434, 581-582, 2005. 4) <http://www.volcano.si.edu/volcano.cfm?vn=372020> “Smithsonian Institution, National Museum of Natural History, Global Volcanism Program”, 2nd November 2010, 30th January 2014. 5) Canitez. Nazihi, Sengor. A.M. Calal,“The North Anatolian Fault”, Geodynamics Series, Alpine-Mediterranean Geodynamics, Vol.7, 205-216, 2013. 6) Andrieux, J., Over, S., Poisson, Andre., Bellier, O., “The North Anatolian Fault Zone: distributed Neogene deformation in its northward convex part.”, Tectonophysics, Vol 243, 135-154, 1995. 7) Gudmunsonn, M, et al., “Ash Generation and Distribution from the April-May 2010 Eruption of Eyjafjallajokull, Iceland.”, Nature Scientific Reports, 572, 14th August 2012.